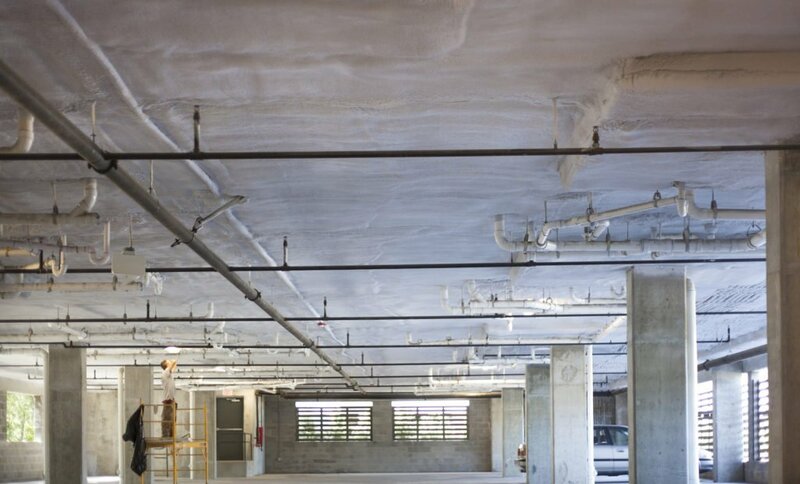 Closed Cell Spray Foam to Insulate Parking Garage Ceilings is being embraced by Multifamily Builders and Property Managers throughout the southeast. The Energy Savings, Moisture and Condensation Control and More Comfortable Living afforded by Closed Cell Spray Foam surpasses all traditional applications. Energy One America is replacing traditional fibrous insulations that retain moisture, are easily damaged and routinely flake off onto vehicles and residents with state-of-the-art Closed Cell Foam. Multifamily apartment and condominium managers throughout the country inherit parking garage issues from traditional insulation or lack on insulation as a regular course of business. Rigid Board Insulation Difficult to insure seals around lighting fixtures, conduits and penetrations, difficult to cut to insure air and moisture tight installations. Cellulose Fiber Insulation Retains moisture, delaminates, is easily damaged and falls onto cars below. No Insulation Has no R-Value, condensates throughout the year, dripping water on cars below, and leaves unreasonably cold floors throughout the Fall, Winter and early Spring months. Completely sealed monolithic application that mitigates thermal conduction of dissimilar materials into the conditioned space. Higher R-Value per inch than other traditional insulation methods. Water and moisture proof which insures that condensation, rain and humid environments will not compromise the insulated areas. Environmentally safe with Honeywell’s Ultra-Low Global Warming Potential (GWP) Solstice® Liquid Blowing Agent. For more information about insulating or protecting your new or existing garage structure please call Energy One America at 843-388-6260 or visit our website at energyoneamerica.com.